Its December 19th and the Space Shuttle took off for the Hubble Space Telescope servicing mission just an hour ago. It was good that NASA got it off in 1999. That launch adds more satisfaction for me for being a United Space Alliance employee. Ive gotten a few holiday newsletters already. So Ill start off with them. Dave & Fran LEE have been on several trips again visiting family and friends, and doing some business. He starts a six-month sabbatical from the University of Dayton at the end of this semester. After the sabbatical, he will return to the University of Augsburg for a five-week stay. (I presume he will be teaching again, since he wrote last year that he had been invited back.) Fran has discovered the wonderful world of email. She can be found in front of the monitor more often than not. They have a new grandson Tyler John, courtesy of Kelly and Dean. Kelly is an assistant principal at a Jr. High and Dean is still facing the challenges as a manager at Lexis-Nexis. David II is still cheering on the Buffalo Bills in Dayton. (That seems like a relatively safe place to cheer the Bills.) And John relocated to Orlando recently from Denver. Thanks Lees for the updates. Charlie & Mary Jo PRICE sent greetings from Valdosta, GA, just up the road 200 miles from me. Evidently Mary Jo didnt have a hole-in-one this year. Thats great for Charlies game...and piece of mind. They have continued to care for Mary Jos parents and enjoy it. They continue to play golf every chance they get, as long as the body is willing. (Im waiting for LA-Z-BOY to develop a reclining chair that will flip you onto your feet when you are finished with a nap.) Their bulldog, Maxine, sounds interesting. "She entertains not only the two of us, but anyone else who dares make eye contact with her. Even in the car she can flash a toothy grin at the driver in the next lane that completely disarms them." Weyerhauser recently bought Charlies parent company, Trus Joist MacMillan. They are assuming that no negative changes will occur. Once again, they invite Redtags to come over and play a round of golf. And this came in from Tom RAUSCH, by way of email. His daughter, Susie, passed her final oral exams for a law degree in Germany. "It is a long, tough course. Four years of university level courses, a written exam, an oral exam, two years of internship, and then another written and oral exam. Needless to say we are very proud of her, especially since she went to Kindergarten through 12th grade and never took a German language course." And we share your pride, Tom. Congratulations to Susie. I got this from George HARRISON. "As an input for the column, we just had a Moody AFB Class 64A reunion here in Atlanta on September 23-24. The Redtags who made it were Jerry DANIEL, Bunky REEVES, Fritz HENDRYX, Ralph CONLAN, and ME. This was our first gathering since we graduated in August 1963. Bunky Reeves agreed to set up the next gathering in about a year in Florida. We hope to expand the group to include those who started with us but did not graduate so well be asking for help to find the lost souls. I know, Jack. Youre part of that crowd. Interested? On a personal note, all is well in Atlanta. Georgia Tech is a good place to be and, since AFA is never on the football schedule, divided loyalty is no problem. Come by Atlanta and call if you get a chance." Thanks, George, for the news. Ill be in Atlanta in June and will call. Got a Christmas newsletter from Fred & Helen HENDRYX. They have decorated the house for Christmas, have all their shopping done, presents wrapped and under the tree. (That just irritates me. I dont even have my shopping list ready yet and theyre done with it all. I hope your address labels fall off in the car trunk.) 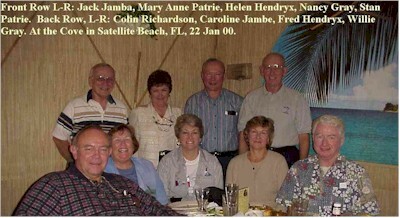 Fred mentioned that the reunion referred to in Georges letter above was a great time. After Christmas, they are heading for Roanoke then on to Melbourne for a three month stay. He is planning a mini reunion here in the local area for the local Redtags and for the pilot training class. He has been chatting with Colin RICHARDSON and Tom YOUNG on the Internet and planning a fishing trip and maybe another hog hunt. Helen and Fred will be looking for a condo here. She wants beachside and Fred wants river or canal for fishing. Ill let you know who wins. (Maybe they can settle on the "Abilene Solution" and pick a place halfway between the ocean and the river  smack dab in the middle of the community with no water for miles.) Caroline and I are looking forward to seeing you again. AJs (Thats what people in Lake Tahoe call Andy now.) restaurant is famous around Lake Tahoe as an excellent gourmet restaurant and is situated on the lakeshore. An old boathouse has been converted to a bar. Thats where they took the picture, wouldnt you know. Thanks to Bob Felts for the picture and news. On a personal note, the family witnessed my daughter, Lisa, receiving her Master of Arts in Education Degree in Student Personnel in Higher Education at Gainesville, FL, last Saturday. Her dissertation was in the area of college students and credit cards. Her faculty advisers recommended that she incorporate herself and also publish her work in the trade journals. She has an offer of a grant to extend the study results at her university as a consultant. Neat! We are proud of her. I was sitting here wondering how I was going to fill in the last page of my column when the mail arrived. Here is a newsletter from Stan & Mary Anne PATRIE. "Its official. As of September 1st, Stan became a retired person. His last flight was on August 15th from San Francisco to Charlotte. It was a wonderful and very special flight, and Im really happy that I got to share it with him. After the landing, very smooth of course, as he was taxiing to the gate, 2 fire trucks saluted the plane with towers of water, then we were greeted by family and friends at the gate and adjourned to a nearby restaurant to celebrate. His crew was wonderful, taking photos of the entire last flight and treating Stan as a VIP. The next day was his birthday, and then on the following day, our son, Greg, and his wife, Lisa, had their first baby, a girl". That was an exciting week for them. They moved into their almost completed house on June 18th and spent most of the summer unpacking and waiting for various construction types to finish up. Stan joined a hiking group and is getting to know the Smokies and surrounding areas. They wish everyone blessings and good cheer. Thanks for the updates. Hope to see you soon. Got a newsletter from Gary & Jeannie BAUGHMAN. They are into the seventh year of their marriage. "At our age, the seven year itch is only going to be a patch of psoriasis." They finished Jeannies big dream, a screened porch overlooking their beautiful back yard. Gary completed his dream also: a finished basement with a kitchen, bath, bedroom, rec room, a home office and a model shop. Gary also laid a brick patio under a deck that runs along the width of the house. They rented a Bobcat to do the excavating and grading for the bricks. Jeannie could zip around on it with no problem. Gary tipped it over once. Jeannie sounds like a candidate for a Tank driver. Gary still plays senior tennis with two teams and was on the city championship team and also the state championship team. The state team came in third in the Southeastern Region finals. That a way to stay in shape. Gary & Jeannie, thanks for the updates. And now I have some words about Redtag Email. Our class now has two mailing lists; RtbGeneral and RtbAnnounce. The RtbGeneral@Redtags.Org mailing list gets a lot of traffic that can overload some email systems. After some complaints from classmates, Owen HAWKINS has created another mailing list for only important announcements and that one is named RTBAnnounce@Redtags.Org. The latter should only be used for significant announcements of general interest to the class and not for blathering back and forth between a few classmates. You can join either one or both. Details on how to join are on the class website which is WWW.REDTAGS.ORG. I think Colin RICHARDSON has established an additional web site for the class blatherers. The dual system was running smoothly until someone sent an email inadvertently on the Announce channel and started a string of one-to-one replies that had lots of people in an uproar. After a series of insults and jabs, the climate has quieted down again. Sign on to the site to exchange email with your classmates. Until next time, be good. I hope everyone had a great holiday season. Please keep the letters, postcards, and emails coming. Go Redtags!